Funky, urban, retro, Smooth-Jazz guitar. 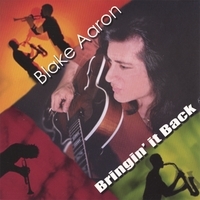 On the heels of the R&R Charting #2 New and Active 6 weeks running single "One Moment With You" featuring David Benoit from the album With Every Touch, comes the new CD from Blake Aaron called Bringin' It Back. A brighter, more energetic departure from With Every Touch, Bringin' It Back blends some of the more funky retro grooves with urban, R&B, and a touch of blues all in a smooth jazz format. The first hit single from Bringin' it Back, "She's So Fine" has a fun, retro, smooth jazz sound as if Wes Montgomery was playing with Tower of Power and aptly features Greg Adams on trumpet.